At last we made it to Harbin. 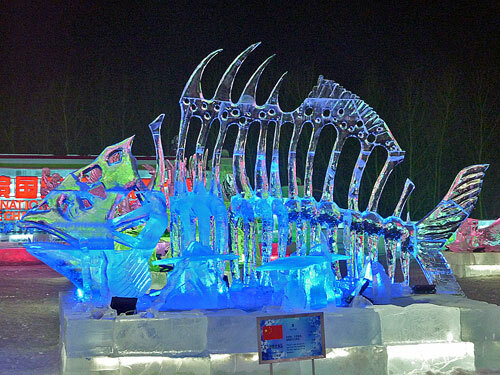 We had wanted to go to Harbin for its Ice Festival for years and at last everything fell into place. 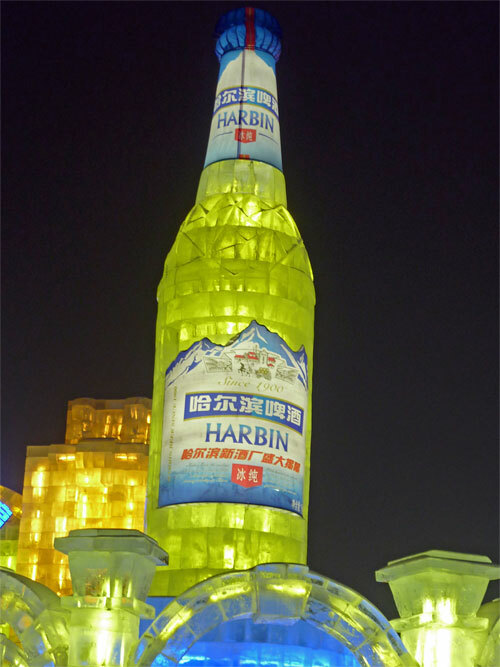 What would the Ice festival be like without Harbin’s favorite brew? 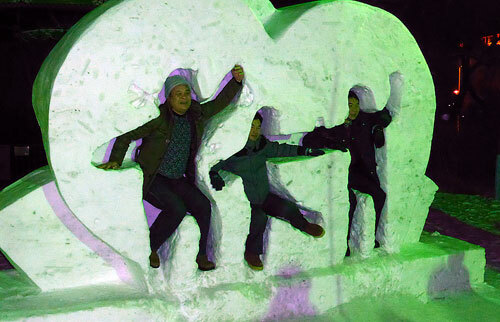 Here is the rundown for this year’s Harbin Ice and Snow Sculpture Festival. Later we’ll be putting up a more personal account. In this post we’ll give you the info you need if you are planning to go this year 2015. This is the big one. 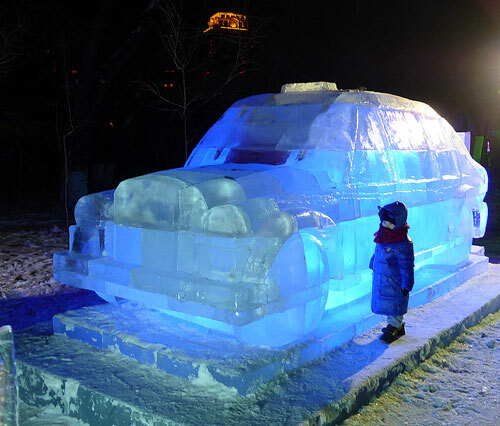 It’s out on Sun Island, and it’s where you’ll find the huge sculptures and most impressive ice monuments. 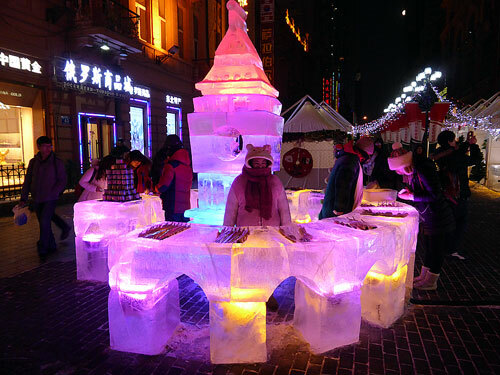 A night visit is really the best option here, because the Ice Sculptures really come into their own when they are lit up. Note: the adult ticket price will rise to ￥ 330 during the Chinese New Year’s Days (January 1-3), Chinese Spring Festival (Jan 30-Feb 5), and the Lantern Festival (Feb 14). 552, 551, 346, 219, 216, 212, 211, 85 or 54, and get off at the Sun Island road junction, then walk several minutes to the entrance gate. 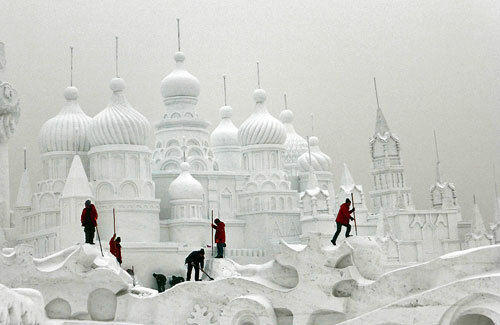 The Snow Sculpture park needs a day time visit. Tickets cost 240 Yuan. 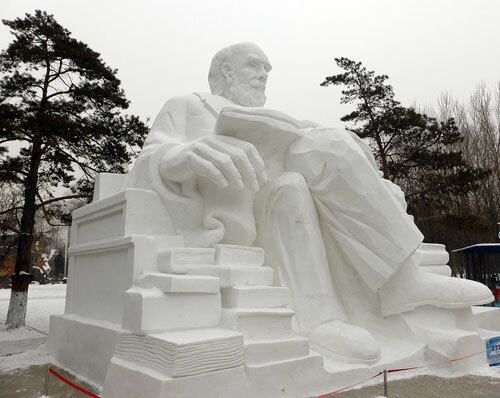 Here you’ll see some of the most amazing and enormous snow sculptures you are ever likely to see. This year’s themes range from Russia and the Kremlin to Darwin and Newton. You can get there by taxi or public bus nos. 29, 54, 85, 88 and 346. 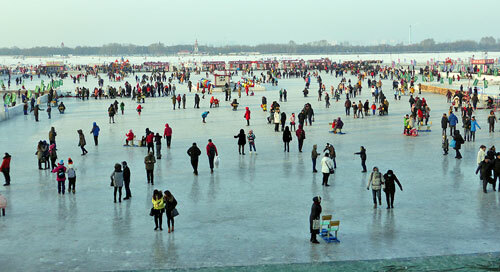 It’s a short, but cold walk to the Harbin Ice and Snow World from here. This one is in downtown Zhaolin Park. 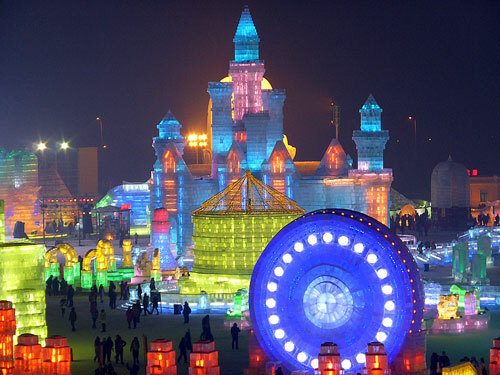 It’s on a much smaller and more intimate scale than the other areas, but it more than compensates for this with its funky sculptures and magic winter atmosphere. 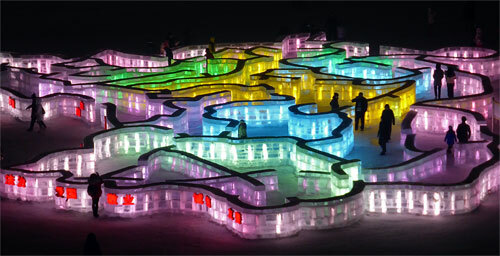 Again it’s better at night, as most of the sculptures are Ice and have lights inside. The London taxi is amazing. Tickets cost 75 Yuan day & 150 Yuan night. You might get in a bit cheaper (120 Yuan) if you allow one of the tour guides who hang out outside the park to take you in as part of a group (once in the park you are on your own). 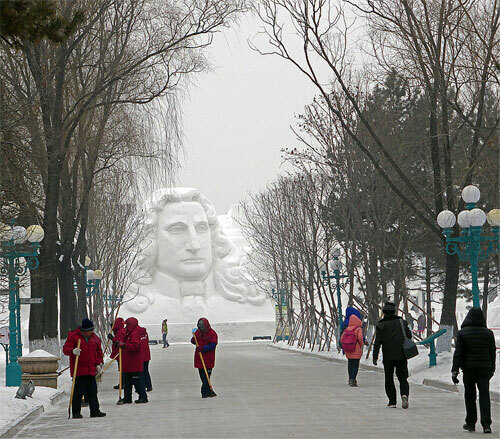 Zhaolin Park is just off the main street Zhongyang Dajie in the center of the city. Admire the Russian and European influenced architecture on Zhongyang Dajie. 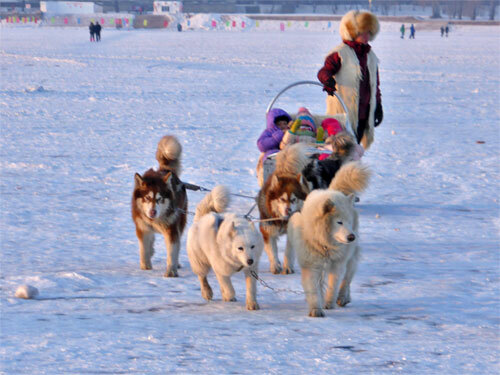 Enjoy winter activities such as ice skating, ice slides and dog sleighing on the frozen Songhua River. Visit the Siberian Tiger Breeding Center just outside town. 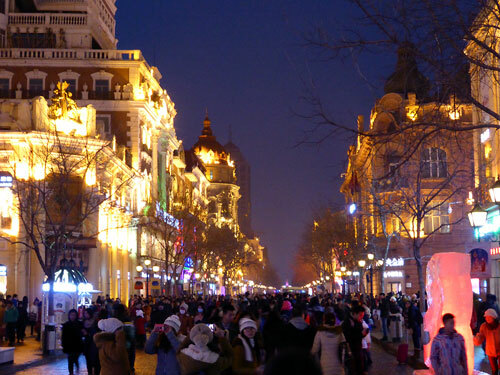 Harbin in winter is cold; really cold. 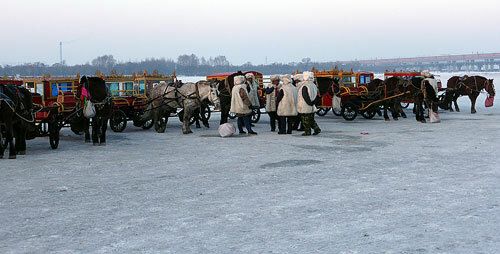 We were lucky; the day before we arrived the temperature was down to minus 23 with a maximum high of minus 15. 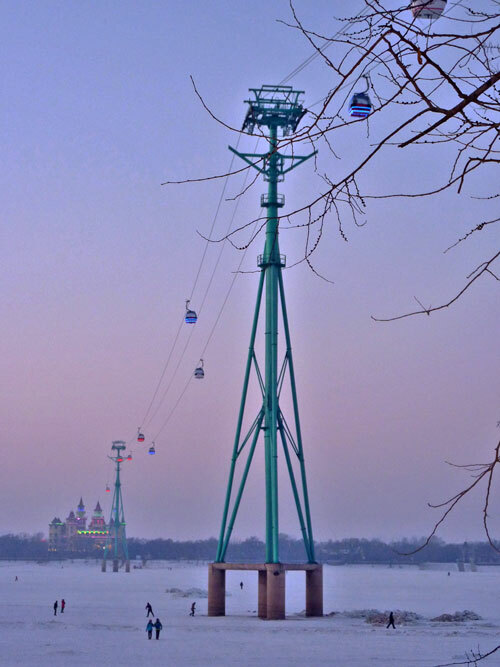 While we were there, the temperature varied between minus 18 and minus 6, which for Harbin at this time of year is quite mild. The day we left, the temperature was heading south again towards minus 25. We found that thermal underwear as well as having lots of layers of clothes was the best protection. The only time I really had a problem was when I kept my gloves off for too long while taking photos; I thought my fingers were going to snap off! We stayed in the clean and functional Ibis Santa Sophia Hotel (Zhaolin Jie). Its location couldn’t be better: it’s 5 minutes from Zhaolin Park / 2 minutes from Zhongyang Dajie and 1 minute from the Santa Sophia Russian Orthodox Church & Museum. Using Booking.com we got a double with breakfast included for 299 Yuan. We found a great Hotpot (Huoguo) restaurant on Jingwei Jie 194/ 经纬街194 (the one recommended in Lonely Planet on the same street has closed). The restaurant was called Sanle Sichuan Huoguo ( 三乐四川豆花饭庄分店). 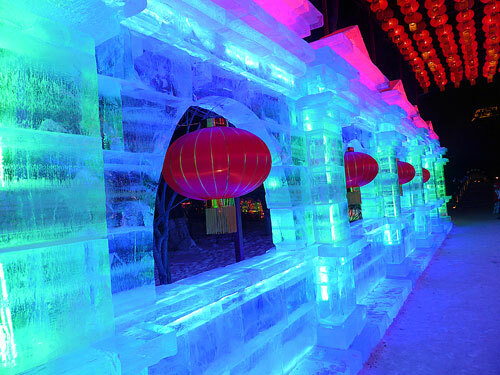 Huoguo is the perfect way to finish a day after hours out in cold admiring the ice and snow sculptures. The restaurant is open late and very reasonably priced. The menu has pictures and reasonable English translations. There are some Russian restaurants around town. 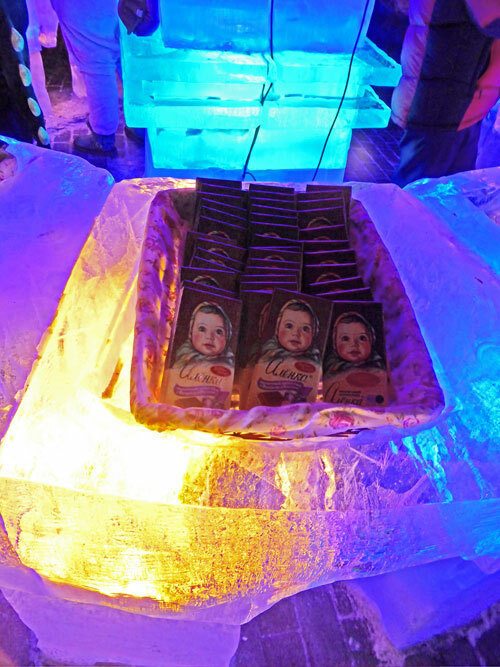 We tried one, and while it was entertaining, the food and service left a lot to be desired. In the side streets just off Zhongyang Dajie are numerous Dongbei (North East China) restaurants. These restaurants are characterized by the huge pictures of their dishes on the wall near the kitchen. You point to the pictures and the waiter or waitress will take down your order. If you don’t speak Chinese you need to be a bit careful as some pictures can be misleading. I was looking at what I thought was fried squid but was actually kidneys cut in a way to make them look like flowers. The food is pretty good in all these restaurants. Buses go to all the places you need to visit. However, with the freezing temperatures waiting for a bus and then walking from the bus stop to the sights can get quite uncomfortable. Being in a small group we took the easy option. We hired a taxi for the whole day. 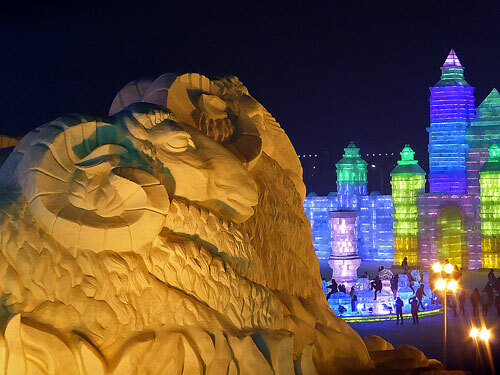 It cost 500 Yuan and we took in the Harbin Ice and Snow World, the Harbin Sun Island Snow Sculpture Art Expo and the Siberian Tiger Breeding Center (see future article). In all it took more than 9 hours. Having a taxi to sit in and warm up between sights is a great luxury. We arrived in Harbin on the 7.20 fast train from Shenyang in Liaoning Province, the journey took around 3 hours. If you are taking a fast train from Beijing it will take about 8 hours. We returned to Beijing on the 6.50 am D fast train (8 hours / 309 Yuan). 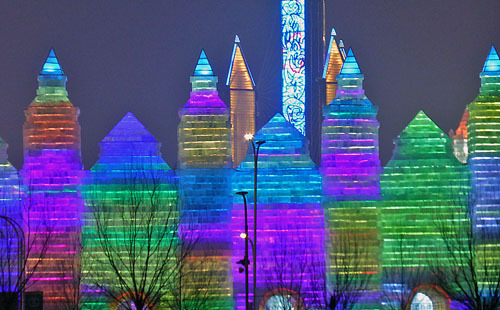 I read news of the Harbin ice fest and thought about you two. So you did make it, maybe next year. It looks amazing. Great pics, been meaning to get to this festival for years now! Have my sights set on 2016. Saludos cordiales desde Ecuador, por favor si fueran tan gentiles avisarme como puedo descargar la entrevista que me hicieron en la feria Int Yiwu de China. Muchas gracias!!! Hello from Ecuador, could you please tell me how I can download the interview that you did at “Int Yiwu” of China.